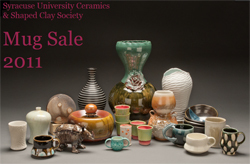 The ceramics program in Syracuse University’s College of Visual and Performing Arts (VPA) and the Shaped Clay Society, a student-run group in the program, will host a sale of work Nov. 30-Dec. 2 from 10 a.m.–6 p.m. in the first-floor galleria of the Dorothea Ilgen Shaffer Art Building. In addition to ceramics, the sale will feature prints and jewelry by students in VPA’s Department of Art. Active on campus and in the community, the Shaped Clay Society uses various fundraising activities to increase educational opportunities–such as bringing visiting artists to campus–and to support local organizations. For more information, contact the Ceramics Program at (315) 443-3830.